These delicious mini dumplings are a highlight on every dinner table and lunch buffet. They can be used as a main side dish, turned into a casserole dish or help you spruce up an otherwise boring salad. The possibilities are endless. The mini bread dumplings are ready to eat in only 5 minutes and are just as flavorful and delicious as their big counterpart. Ideal for all the busy bodies out there. 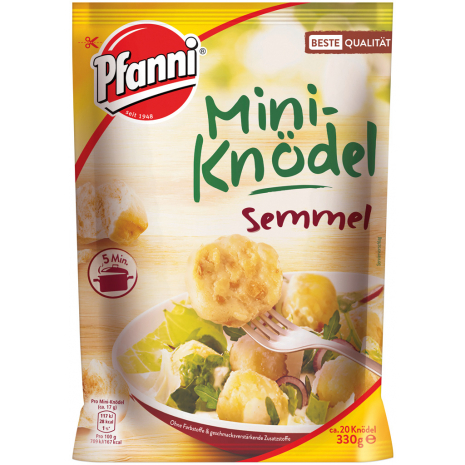 Each package contains about 20 mini bread dumplings. In a medium saucepan bring 1.5 quarts of water to a boil, cut open the mini dumpling bag and pour contents into the boiling water. Cover with lid and reduce to a simmer (not boiling) for 5 minutes. The dumplings are ready when they start floating on the surface. Drain the water or remove dumplings with a skimmer. Dumplings are now ready to serve. Enjoy! Cooling is not required for this product but once opened it should be stored in the refrigerator and consumed within 3 days. 330g / 11.6 oz NET. WT. 46% bread chunks (WHEAT FLOUR, salt, yeast, sunflower oil, paprika), water, modified starch, WHOLE EGG POWDER, LACTOSE, rice flour, salt, onions, sugar, preservative (potassium sorbate), sunflower oil, flavors (with CELERY), spices (nutmeg, turmeric), yeast extract, glucose.